Customer service emails have a way of being pretty terrible. As a company, if you don’t make a solid effort to build good systems around your email customer service, it’s going to be a drag. It got us thinking about how we do email support here at Statuspage.io. We’ve noticed a lot of great companies have a handy auto-reply locked and loaded to go out whenever a request comes in. It lets customers know the message was received and the support team will be in touch. We don’t use an auto-reply here at Statuspage.io. We’ve tried to keep our support personal and timely enough to not warrant one. But as we celebrate 2,000 customers and growing, we’re wondering if an auto-reply is necessary. There is some documentation out there online about setting up auto-replies — Helpscout, for example, does a great job making this a feature on their product. We wanted to see how other companies answered these questions. So we launched an experiment. Let’s file a bunch of support tickets to see what kind of auto-replies we get. Let’s file 100 of them. Here’s how it went. I’m no scientist, but I knew we wanted a certain level of control here. You can’t just send out 100 emails without having some process around it. The first thing to do was decide which companies to send these out to. This was probably the most subjective part of the experiment. One hundred companies seems like a lot until you start considering the many thousands of potential companies to pick from. I knew we wanted a lot of SaaS companies and a good mix of technology startups. I also wanted a range of small, medium, and large sized organizations. But just for good measure, some non-tech and legacy brands could be interesting. A lot these companies have been thinking about customer service for generations. I added a few hardware companies, some airlines. I listed all these companies in a spreadsheet where I could keep track of whom I’d reached already and their responses. Here was one struggle with this project. Customer support teams have enough going on. I didn’t want to waste their time or put them in an awkward position. I also didn’t want to file a make-believe support request or just file an empty ticket. So I had to write a query that would work for all these companies, exercise transparency about what I’m up to, and give the support reps an easy “out” if they were too busy to mess with any of this. I’ll cut to the chase and let you know that this message is not an actual support request. My name is Blake, I work over at Statuspage.io. I’ve noticed that a lot of companies have great auto-replies set up for their support inboxes to confirm that a ticket was received. I wanted to write about how to do this for our blog. So I decided to send a bunch of requests to different support account to see how different people set up auto-replies. If you don’t have an auto-reply set up, don’t worry, I won’t call you out for not having one. If I do get an auto-reply from you, I’d love to use it as an example in the post. I’ll obviously give credit where due and link to you. If you want to reach me directly to tell me more about your auto-reply, that would be great! Try blake@statuspage.io (I sent this email from a dummy account I made for this project). So actually filing all these support tickets was a lot of legwork. But I learned a lot about the support process from the customer’s standpoint. It was surprising how many companies didn’t seem to have an easy way to send a support ticket. For most companies you can find an email form or address after one or two clicks. A lot of others didn’t have that. I wound up having to guess for a few companies. I’d send an email to support@ or help@ and cross my fingers. In a lot cases, the bigger a company gets the harder it is to actually find a way to contact support. Maybe remarkable support just doesn’t scale. But does it have to be this difficult to find an email address? In case it wasn’t obvious to you already, the most common support email addresses are support@ and help@. Medium’s is yourfriends@medium.com, which is kinda cool. One company, won’t say who, only has their snail mail address listed. Yikes. Another company wouldn’t let me submit a form without using my work email address. Come on, guys. Wow. Auto-replies are more popular than I thought. Companies that told me they turn on an auto-reply at certain times, like evenings and weekends. These were fun. One read: “Does having a support guy reply back very fast count?” Nicely done. Yikes. I hope none of our customers are getting these. No way of knowing what’s going on here. Maybe I didn’t submit the ticket properly. Maybe they saw my weird message and ignored it. Maybe everyone at the company was kidnapped. I was surprised by the types of companies that do and don’t set up an auto-responder. Going into this we kind of figured the larger the company, the more likely we’d get a robotic reply. While there’s some truth to that, we found exceptions up and down the list, from tiny startups using auto-replies to big-name companies sending personal notes right away. Airbnb, for example, sent me this message. It seems obvious, but you’d be surprised how confusing some of these confirmation emails were. Some simply say “you’ve been assigned a ticket” doesn’t tell me much. Does that mean someone will look into my problem or not? Do tickets get addressed in a timely manner? Do I need to take this ticket number and do some other step? Don’t make your customers take these guesses. Just let them know that their message was received. These acknowledgments don’t have to be anything complicated. Just get to the point. Here’s a great example from Stripe. You can see it’s clean, simple and to the point. One of the best things you can do in these auto-replies is let the customer know when a response can be expected. Filing a ticket can be nerve-wracking. People wonder when their question will get answered. They wonder if they should try a different channel to get quicker service. If there are any unusual circumstances, like holiday hours, make that clear as well. A few companies did a great job including information on when a response can be expected. Check out these from Postmates and Zenefits. We like to bundle support requests all into one big category: tickets. A ticket is a ticket is a ticket. Right? Wrong. Some tickets need immediate feedback, some are cool sitting for a few days. This can become a problem if you’re married to the idea of addressing every ticket as they come in. Some need to jump the line. The best way we’ve found to do this is by opening up a couple different support channels. If you have a live chat tool, for example, or even a phone line people can see that they can use this for quicker emergency support. Someone with a slice of low-priority feedback isn’t likely to call you on the phone. The person in the middle of a server meltdown with their business on the line just might. Suffice it to say, we’re fans of making it clear in your auto-response that customers can reach you these other ways. If you have a live chat, phone line or some other way of accepting support tickets, make that clear. JustFab does an excellent job. A lot of support problems can be handled without direct assistance. Often it’s just a matter of getting the right information in front of the customer having a problem. Support auto-replies are a great way to point customers to your documentation and troubleshooting info. 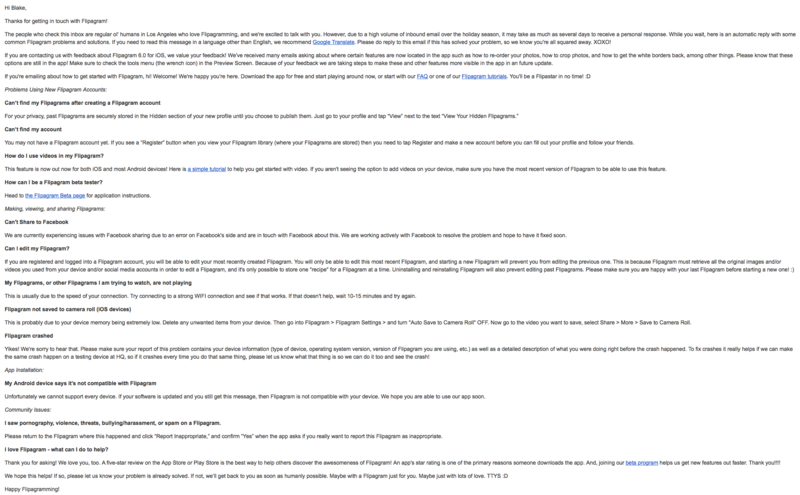 Flipagram did a great job including a ton of helpful details, all without having to leave the email. There’s a lot of text here to fit inside one image. Click here to more easily see the Flipagram email. It takes a certain level of grace to pull it off (and the right kind of company), but even a customer support email can be fun. Even an auto-reply from a robot can have style and voice. Here’s an excellent example from the team at Tilt. There’s the Imgur email, which includes a link to a picture of a puppy. Notice, though, that not just anyone can pull this off. If you’re going to do something clever or funny, it better match the tone of your company. Check out the rest of Tilt’s branding and you’ll see this copy is pretty in-line with how they present themselves: fun, youthful, playful. If I’d got this email from, say, Berkshire Hathaway, I’d be distracted and a little confused. Nobody but you knows if a customer service auto-reply is right for your company and your customers. As you can see, there are all sorts of different solutions and a lot of different flavors of customer service auto-response you can send. If you decide auto-replies are right for you, there’s one thing you should take away from all this: put the time in. We won’t point fingers, but there were more than a few emails we got back that seemed just plain lazy. It’s easy to see where that comes from. A founder or support staffer charged with putting together the auto-reply has a lot to do. It’s just a quick confirmation email, they figure. Why spend any time on it? Think again. Depending on your business, these customer support auto-reply messages might arrive with many (if not all) of your customers some day. Thousands of people who use your product may get these in their inbox. It’s the first point of contact for customers having problems. This is your chance to win them over or lose them for good. Don’t take that responsibility lightly. Put the time in. We like to think Statuspage is an important piece of any support team’s toolbox. What does Statuspage do? We make it easy to keep customers informed when things go wrong. Support teams have a huge responsibility to keep customers in the loop during things like system downtime. We make that a little easier. We could tell you more, but we’d rather you see for yourself. Our trial is free and unlimited, so there’s no harm in setting up a page and seeing if it works for your team.